Last week’s electric new chapter of Dexter, “Swim Deep,” had us descending into new, exciting depths of Dexter’s season seven journey, priming us for the thickening of the fiery plot in tonight’s “Do the Wrong Thing.” If we thought we were in deep last week, we have since been transported from a murky ocean floor of uncertainties and possibilities to the glimmering darkness of the Marianas Trench. Who did the wrong thing? Did anyone do the right thing? If you’re still reeling from the thrill of the confusion, try to ground yourself with the mini-synopsis below, followed by an in-depth review of just what is spinning into fearsome motion with this episode and its sure-to-be-harsh implications! Are you ready to reenter “the wrong thing”? CAUTION: SPOILERS AHEAD. MORE SCREENSHOTS COMING! To begin with an editor’s note: allow me to first say that I struggled very much throughout this episode. It was by no means an easy ride for me, nor do I imagine that it was for anyone else! Already I’m watching a great deal of heated controversy unfold about an episode that is, itself, very thick with controversial events that we perhaps saw coming—but did not see evolving the way they violently did. While “Do the Wrong Thing” specifically refers to Dexter’s egging Hannah on, urging her to quit walking in safety and err into his deadly arms, there is a whole lot of wrong afoot in this difficult, volatile run, for virtually every character. Isaak is starting to tease his way out from behind bars with the manipulation of the poor, can’t-catch-a-break Joey Quinn; Debra is left to tread puzzling waters as she desperately tries to defend her wayward brother—whose grievous errors are becoming more and more obvious—and uses a new-found yet fairly trivial relationship to find out more about Hannah’s dark and problematic history; Batista is listening to the enticing voice of a midlife crisis that is urging him to retire from his police service and buy a beach-side restaurant… change is at work on every layer of the story. If things weren't fully in motion before, oh: they are now. The most disconcerting aspect of the delicate dance of these subplots is that they are all bound to collide in a way that, to say the least, will be far from delicate. This episode specifically concerns itself with the innumerable rights and wrongs that everyone must choose between to keep hell on earth at bay. Is anyone taking the highest road here? Dexter’s thorny interactions with Hannah will implicate everyone in the long-term; their liaison is certainly not going to stay under the sheets for long, and its spread just might reach a fever pitch before Dexter can tidy the scenario up with his proclivity for fastidious neatness. His vision of Harry won’t be the only individual whose eyebrows are raised at Dexter’s impulsive chain of decisions in luring Hannah McKay ever nearer. To Dexter, the only way he can give Hannah “what she deserves” is by gaining her trust; the best method he can conjure up to achieve the fruit of this mission is to pursue Hannah from a romantic angle, despite her personal barriers against commitment and intimate involvement after getting the knees of her sincerest hopes broken by Wayne’s indiscretion (or so she claims). Their loaded conversations and rich yet unreadable exchanges serve as evidence of two very aroused Dark Passengers at play. We can’t help but recall, however, how detrimental Dexter’s inability to off a truly treacherous foe was: case in point, Trinity. Just as Dexter sought to learn from Trinity the ways of balancing one’s family life with an irresistible compulsion to kill, Dexter seeks to gain something more from Hannah. The challenge that Hannah issues to Dexter while under the cold glint of his ready knife—telling him to do what he’s got to do—seems to light that same kind of fuse in Dexter that was lit by his awe and curiosity by witnessing the thrilling duality in another "monster" like him. In fact, here there is even more than a little wriggling curiosity: there is intoxication, even sacrilege, as his hallowed kill table quickly turns into a sacrificial surface: goodbye routine, hello sexual extravaganza. And it looks as though this “intertwining” won’t be their last. Hannah did the wrong thing in buying into Dexter’s promise of fulfilling the dreams that Wayne failed to; did Dexter do the wrong thing in sparing her mysterious life and allowing it to bond with his? Something tells us that a relentless storm is on the horizon, especially with the information that Debra is eliciting from Price, whose interest in the production of crime novels leads him down a rather telling alley. 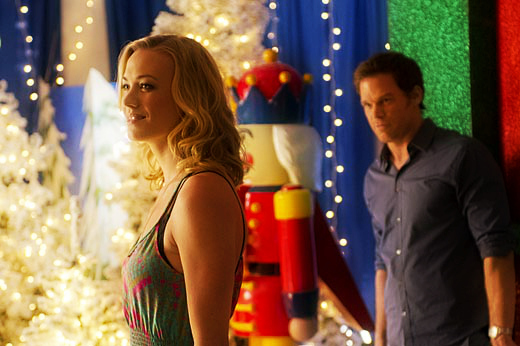 Hannah just might prove to be as poisonous to Dexter and his community as the tactics she has employed with a number of people in her speckled past who died of questionable “heart attacks.” It appears that Hannah’s Dark Passenger has a bit of a green thumb; her “nursery” of vibrant life hides the agents of death. As an amorous Price lets Deb in on his dirty little secrets over a low-key date, everything starts to come into focus before Debra’s heavy eyes: perhaps Hannah really is hiding malicious decadence behind her immunity. She has stricken, and will she strike again? It’s not so much a matter of if, really, as it is a matter of when, and how. Little does Debra know that by sniffing down Hannah’s trail, she’s drawing herself into a new secret of Dexter’s that will force him to decide between the Code and the thrill of a new ride. Of course, the Code isn’t the only thing at stake here: Dexter is an obligated man who’s flying off the handle just to let the Dark Passenger he has fought to nurture take on a diet too rich to sustain. Hannah is femme fatale material with some ominous twists up her sleeves yet. The thrill of it all is that we just don’t know what kind of a viper she is; where will she sink her teeth, and to what gain? Will Dexter take her side, affording room for a serious betrayal of everything he has ever known? Will Debra’s discovery of their freshly-minted relationship inspire her to jealous rage as her feelings continue to simmer in her heart? How long will she take his side if he is neglecting hers? We can be sure that Hannah’s company will be a complex force in Dexter and Debra’s rocky journey to reconciliation, as well as Dexter’s forthcoming encounters with the mortal enemy he has found in the restless, cunning Isaak. Wickedness can’t be forced to lie down for too long. 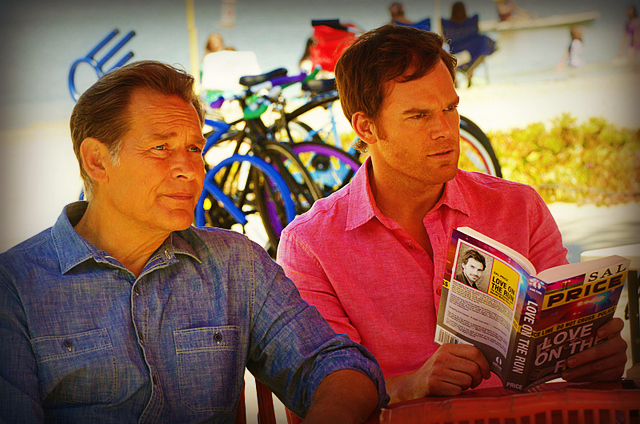 But in the face of Dexter’s fatherhood and whirlpool of commitments and loose ends, there is too much at stake for him to meet such a daunting opponent without his guns drawn, intellect focused, and eyes open. How did you react to this episode? What do you anticipate is looming ahead as “Chemistry” swiftly approaches with its sure-to-be-stunning developments? Sound off in the comments below!